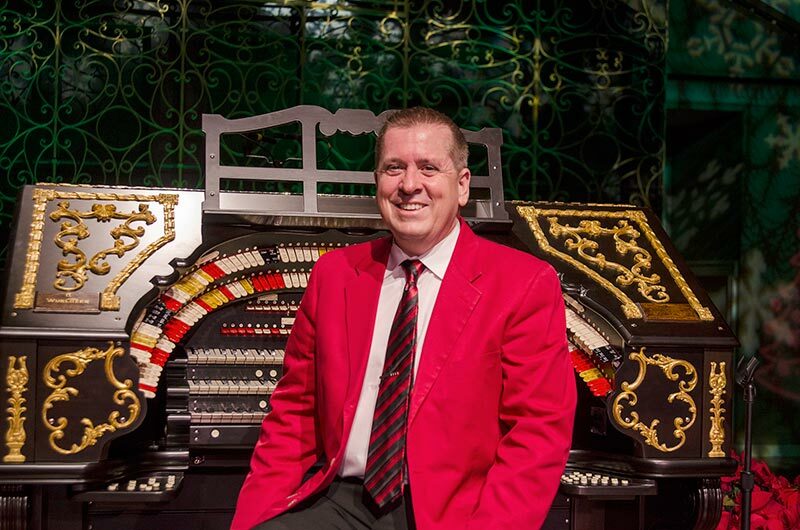 On Thursday, December 7, 2017, in Music Hall's renovated Ballroom, SPMH presented ''Happy Holidays with the Mighty Wurlitzer'' organ featuring award-winning organist Walt Strony. Cincinnati's favorite vocalist Nancy James, and talented young dancers from the Cincinnati Ballet's Otto M. Budig Academy also performed, to the delight of the standing-room-only crowds. Walt Strony has been twice voted ''Organist of the Year'' by the American Theatre Organ Society. This was his second performance on the Mighty Wurlitzer organ; the first was the 2013 Mighty Wurlitzer Holiday Concert. The talented and beautiful Nancy James first performed with the Wurlitzer in May 2016, right before Music Hall closed for renovation, and she joined Walt Strony to bring back these popular theatre organ concerts. Walt Strony makes his second appearance on the Albee Mighty Wurlitzer Organ. Nancy James, Emmy Award-winning performer, returns to the Music Hall ballroom by popular demand. Mighty Wurlitzer concerts play to sold out audiences, and this one is also "SRO." Bob and Cherry Staab are getting ready to enjoy the show! Elaine Billmire and David Billmire, with Don Siekmann, before the performance begins. L->R: Katie Weed, Karen Weed, Hunter Weed, and John Weed are happy to have an evening at Music Hall! Don Siekmann welcomes (L->R): Bob Lance, Lynda Lance, Carol Martini, and Joe Martini. Friends night out at the Wurlitzer concert! L->R: Carolyn Rand, Betty Straus, Linda Siekmann, Marion Stites, Ann Wiethe, Alice Penrod, Betty Tonne, and Carol Parsons. Linda Siekmann (second from right) chats with Bunny Doebling, Wayne Doebling, and Gail Lipps before the concert. A talented young dancer from the Cincinnati Ballet Otto M. Budig Academy performs a selection from "The Nutcracker." Talented dancers from the Cincinnati Ballet Otto M. Budig Academy perform their interpretation of highlights from The Nutcracker." Santa Claus stopped by the Music Hall Ballroom to wish everyone a wonderful holiday season. The amazing Nancy James performed favorite songs from the Holiday songbook. Ron Wehmeier restored the Albee Mighty Wurlitzer Theatre Organ and installed it in Music Hall's Ballroom. SPMH Board President Peter Koenig brought his favorite date, wife Lucy Hodgson. L->R: SPMH President Peter Koenig, immediate Past President Don Siekmann, performer and audience favorite Nancy James, and musician Walt Strony. Santa and Don Siekmann share a moment during the "Happy Holidays with the Mighty Wurlitzer" concert, December 2017.